Drawing Acts is about drawing, both as art and act. Taking the study of drawings beyond the traditional agenda of connoisseurship, David Rosand explores the significance of the making of drawings, the meaning in the line of the draftsman, and the recreative dimension of critical response. The book focuses on drawings by artists such as Leonardo da Vinci, Raphael, Michelangelo, Rembrandt, Piranesi, Tiepolo and Picasso, as well as on the history and theory of the medium itself. 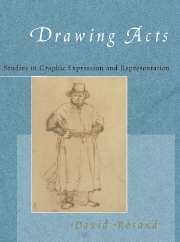 It seeks to establish new foundations for the criticism and appreciation of drawing, which is often considered the most revealing record of artistic creativity, offering the most direct expression of the artistic self. 1. Criticism, connoisseurship, and the phenomenology of drawing; 2. Disegno: the invention of an art; 3. The handwriting of the self: Leonardo da Vinci; 4. Raphael and the calligraphy of classicism; 5. Disegni a stampa: the printed line; 6. Michelangelo: the urgent gesture; 7. Rembrandt's reach; 8. Capriccio: the antic line.